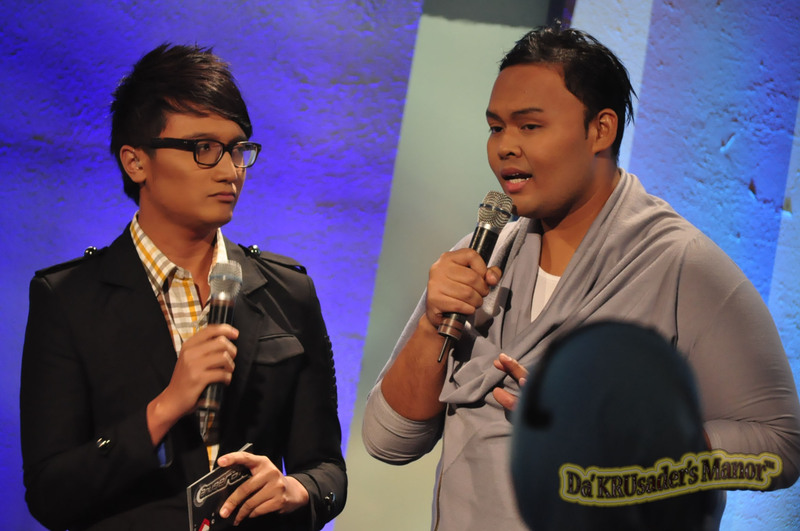 Anugerah 2011 continued its episodic journey this week, with the first quarter-final rounds getting underway involving the male contestants on Tuesday night. The contestants were required to perform songs sung by local artistes. As a side challenge for this particular round, the contestants are also judged based on their ability to host short segments introducing their fellow contestants alongside the resident hosts, Fauzie Laily and Huda Ali. But before the show began in earnest, it was the matter of culling the competition which had to take precedence. The guest judge for this round is none other than my favourite from last year’s Anugerah Skrin competition, Rilla Melati. Up stepped the young ladies to face the firing squad. It was somewhat a surprise to see only five of them standing to accept and receive their respective fates in the competition, when originally there were supposed to be six. Norul was conspicuously absent from the ones who had lined up, with word going round in the audience that she was unwell. This was then confirmed by the hosts. Fortunately for her, she got through along with Rahayu Ridwan, Baby Sulastri, Erlina and Shikin. Here’s hoping that Norul would be well enough by next week to continue her journey in the competition. Based on what we have seen so far, the girls are much better and stronger than the guys and each has her own differing strengths and qualities to advance. I felt Shalyza‘s elimination was harsh, but such is the nature and uncertainty of a reality competition that one needs to point the finger at the supporters for not voting enough. There was a lady sitting at the row behind me who lamented Shalyza‘s elimination, but the fact remains, if you don’t vote enough, your favourites will not progress unless he or she scores perfectly with the judges. Even then, it is not a given that the contestant will sail through to the next round. However, I am confident that Shalyza will be given a reprieve by going into the Wildcard Round. 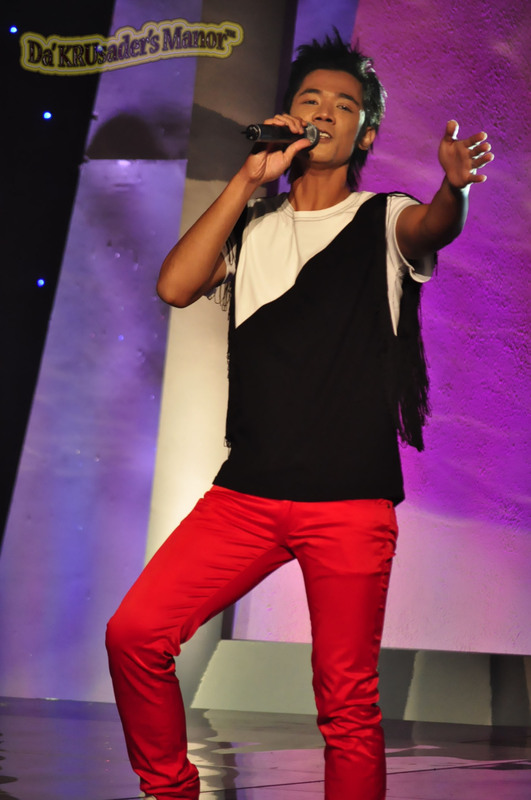 Faziz (Hosting) – He was given the honour of introducing the first performance of the night by Syazani. Even before he opened his mouth to speak, one could detect his nervousness just by the way he stood, and his body posture giving away his emotions. I dunno if he had properly run through his short script or not, but I found it “sinful” that a simple word like “Janggal” could be mispronounced confidently as “Ganjal” (is there really such a word in our Malay dictionary??? ), and even insisted on it after Huda had tried to give hints and corrected him. A word of advice to all contestants: Please jolly well brush up on your command of your own mother tongue as this is the lingua franca and path that you have chosen to make a name for yourself / make a career out of it!!! 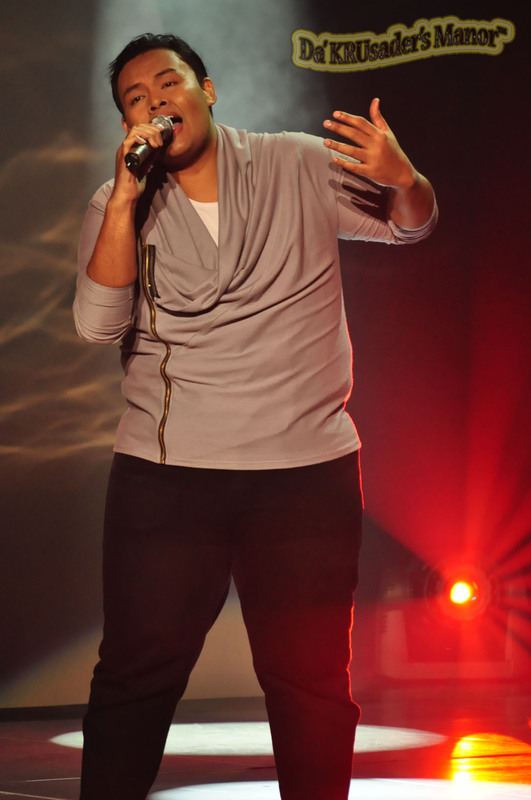 Syazani – Performing the song that he had sung during the first round of auditions, Merah‘s “Cintaku“, it was difficult to detect any wrongdoing to his performance no matter how minute it was, even if judge Eddy Ali had said the first part of his chorus sounded a bit flat. I thought his performance was coolness personified and sounded much better than even the one he gave during the audition rounds. I felt it was a good start to the performances of the night and a good benchmark for the others to follow. Firdaus Haridan (Hosting) – Like what guest judge Rilla Melati had correctly pointed out, Firdaus has a warm and may I add, a very sincere smile to go along with his gentle giant personality. Though Rilla also observed and commented that his style of hosting is what you would expect at a school concert, I wouldn’t be too harsh on him as I felt he did quite ok, fluent and also being observant as to mimic Ace‘s style of gesturing whenever he performs on stage. That in itself is good homework that he has done to add a bit of colour to his presentation style. 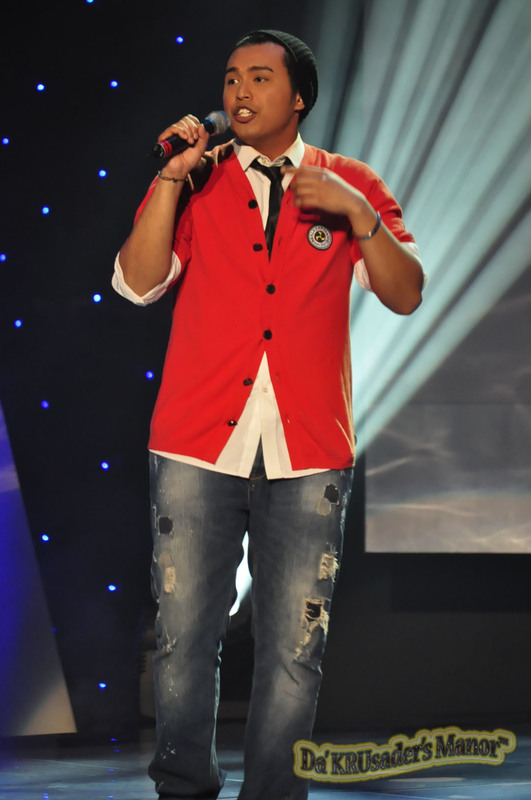 Ace – I finally got to see why Ace was chosen by the judges to advance into the televised rounds of the competition. Granted, Ann Hussein did brought up a credible point about him sounding like the original singer, Aqmal N, when he sang “Warkah Cinta Dunia“. However it was only the first part that I detected the similarities in style and execution. When he broke into the chorus, he was on his own and he ended the song with much aplomb, that the whole auditorium broke into applause. If anyone had noticed, he almost tripped on his lyrics during the chorus, but he managed to compose himself henceforth. Syazani (Hosting) – It was evident that hosting does not come naturally for this guy, since he took quite a number of short pauses throughout his two minutes to recall what he had to say. His presentation style was also a bit too relaxed, like conversing with a friend, perhaps a fair reflection of his outwardly cool and calm personality. Like what Rilla had mentioned, he has the potential but he definitely needs loads of practice. Epul – It took a very brave person to sing a song that might not be everyone’s cup of tea, even if our local act, The Sallys, had rearranged the song that Epul sang, “Kopi Dangdut“, to suit their music style. Though his bravery was commendable, I was cringing at my seat seeing him try to gyrate and pointing to the sky as he sang. At times he sounded pitchy, whereas at the start, he also tripped on his lyrics. Watching him perform was like watching a comedian doing his stuff. This genre is guaranteed not his style and should never be repeated, unless Epul has designs on being part of the new generation of local comedians. Ace (Hosting) – His nervousness or apparent lack of confidence showed through the way he held his microphone. However he eased into his role as he went on. Credits should be given to Ace for complementing Firdaus in kind by pointing out to the audience the latter’s trademark style of performing. Another good point was the part where he brought up the interesting fact on Aliff Aziz‘s song “Nyala” which was used as a theme song for a drama series, an indicator that he bothered to do a bit of research. Non-fans of Aliff Aziz would appreciate that little piece of trivia, no matter how trivial it might sound. 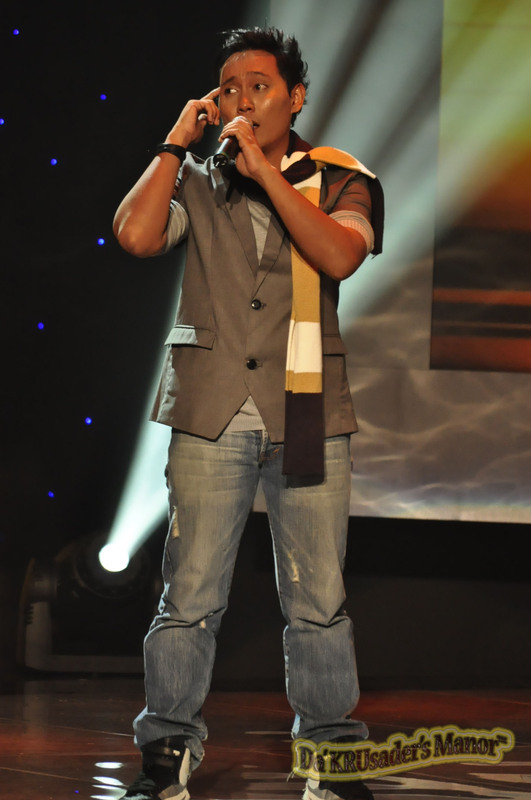 Firdaus Haridan – He performed Aliff Aziz‘s “Nyala“, a song very much suited to his vocal range and musical tastes. What I observed was a performance that had emotions thrown into the mix, making it an indelible concoction. Soulful, majestic, judge Eddy Ali was right when he said Firdaus delivered the best performance of the night. If he had exuded a wee bit more of those emotions, I believe those watching and who are naturally melancholic, would be dabbing their eyes. Epul (Hosting) – I dunno if he had sore eyes or if he had put too much powder on his face and eyes, but the constant blinking of his eyes was a source of irritation for me. I also did not understand what he was trying to put across as he sounded as though he was rushing through the segment and just mouthing off like an express train. But it has to be said, Epul has an endearing quality of being a joker without having the intention of being one, precisely highlighted by Rilla. Faziz – It doesn’t take a rocket scientist or a singing competition judge to point out that Faziz was a major disappointment on the night. Performing a song like Diorama‘s “Sanubariku“, should have been comfortable, easy-going and most importantly give the audience in general, a feel-good feeling. He made things difficult for himself, going off-key as he entered the chorus, going out-of-tune and being pitchy throughout. I would be very much surprised if he were to advance to the next round, when the results are announced in a fortnight’s time. Just by listening to the contestants’ short interviews prior to this performance when they used words like “cuba” (try), wanting to have a husky voice like Man Toyak to be able to sing and having to listen to the song that they were supposed to perform, Cradle‘s “Sementara“, a few times to get its essence and feel, it was clear that the rock genre is not their cup of tea. And it showed in their performance. There was nothing rockish other than their outfits and doing synchronised dance steps are not what you would expect to see from rockers out there. I’m sure true-blue rockers who watched this particular performance were either cringing or laughing their hearts out. There was also too much individuality, with no teamwork and no harmony. Each wanted to be a standout on his own. The only good point I could derive from this segment or to be more precise, the video clip prior to this performance, was the sound advice dispensed by Man Toyak for the contestants to always maintain their self-discipline. He was also astute in his observations of previous Anugerah contestants who disappeared from the limelight once the competition is over, citing their lack of initiatives to do a bit of research on the music industry and laziness to self-improve on being better all-round performers, lamenting and complaining instead that their management unit are not up to par. Truly he knew what he was talking about and was not shy to be extremely blunt about it. Before I end my entry I would just like to suggest the good people at Mediacorp Suria to place artistes / eliminated contestants / non-performing contestants to sit at the front row, which is normally shown when the cameras focus on the judging panel whenever they share their thoughts. For the past two weeks I attended, some seats at the corners were taken up by the general audience. The previous week, those who had sat there were generally well-behaved. The same could not be said from this past Tuesday night’s affair when we had three or four clowns being so hard up about appearing on national television. I’m sure viewers at home were distracted by their incessant hand gestures and cam-whoring poses, so much so that they were told off during the last commercial break. Another thing I would like to highlight is the unruly, uncouth, uncivilised and uncultured actions displayed by some of the supporters of the male contestants. I understand that cheering and shouting encouragements to your friend/s on stage are the reasons why you are at the auditorium, but there is no need to heckle other sets of supporters / contestants or exchanging vulgarities with one another. There are young children who are also part of the audience. What they see, they will imitate as they believe it is alright to do so, if others can get away with it. You know, this is 2011, yet a certain part of our society still do not know how to display the correct decorum and actions at different events. This is more embarrassing and made even worse when the audience had to be reminded not to litter the compounds outside the Mediacorp building on their way home. Honestly I hate the sight of these people as I exit the building, cos not only do they hang out in groups, but after lighting up their cigarette butts, they would be throwing them all over. It’s not that the contestants have not been briefed by the producers to inform their sets of supporters to behave themselves, they have, but somehow in the heat of the competition, everything goes out the window. This rowdiness and social irresponsibility has no place in our society and just giving our community a bad name, but do these idiots care?? ?